How did your interest in robotic surgery begin? 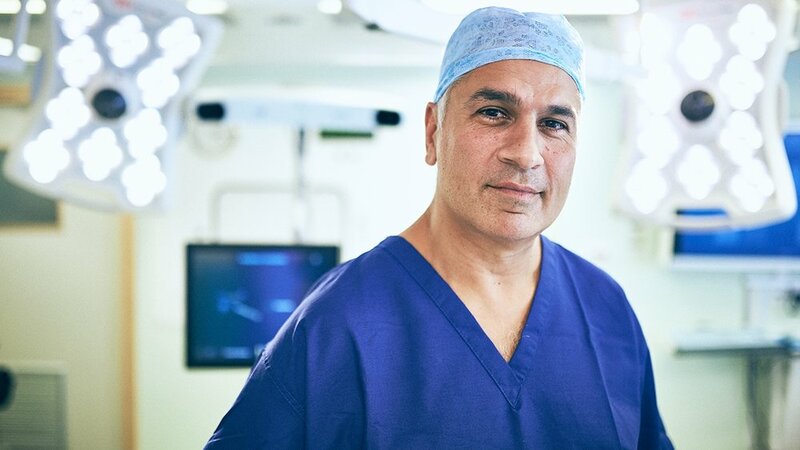 During my training to become a consultant, there was a lot of interest around navigation technology, which involves using computer technology to assist in knee replacement procedures. The position of the surgical cutting block is tracked during the procedure, and shown on a screen. The surgeon can use this information to position the location of the instrument extremely precisely. In 2004, I visited Perth on a fellowship to train in computer-assisted knee surgeries. I found it fascinating and hugely exciting. Since then, every knee operation I have performed has used some form of technology. Is the knee a complex joint to operate on? It can be. We call the knee a ‘tricompartmental’ joint, because it is made up of three compartments: the medial, which is on the inner side, the lateral on the outer side, and the patellofemoral, at the front where the kneecap sits. These three compartments can wear at different rates and in different ways. What types of knee replacement are there? There are two. The first is a total knee replacement, where you replace all the compartments with prosthetics, giving the person a whole new knee joint. Then there is a partial replacement, where only the damaged compartment is replaced. Partial replacements are trickier operations, and require extra training. In the UK, only about eight per cent of replacements are partial. I have a keen interest in partial knee replacement because I think this is the better route to take, as it removes much less normal tissue. With robotic techniques, you can perform the surgery much more precisely, resulting in consistently good results. Why are partial replacements better? If you look at the patterns of arthritis, which is the main reason for knee replacements, patients predominantly suffer from damage in one compartment. If the ligaments are intact, I believe it is much better to do a one-compartment replacement, as you only need to make cuts in the tissues supporting the damaged area. Why is protecting the ligaments so important? Apart from the general principle of doing no more than is necessary, the nature of the knee joint means the ligaments not only hold the joint together, but also have to work in harmony for the joint to function properly. Each time you move your knee, these ligaments should respond in specific ways. A knee joint is in balance when all the ligaments move in the correct position, with the right amount of tension to control each movement. You want to get as close to this situation as possible after fitting a prosthetic, so I think it is best to leave the soft tissue untouched unless it has become damaged or distorted through long-term strain caused by the condition or injury. Is there a core element to the robotic procedure? During the surgery you create a three-dimensional computer image of the patient’s leg, above and below the knee joint. This is done through a process called ‘physical registration’. You trace a specialised stylus along the bones, ligaments and other soft tissues that make up the joint. The stylus continually transmits its position in space back to the computer, which builds a model of the knee based on the data it receives. The information you get is the equivalent to that from a CT scan. This is a crucial process because if done incorrectly, the surgeon will base their plan for the procedure on inaccurate information. Why is registering the joint so important? For knee replacements, the implants usually have to be positioned in reference to what is known as the patient’s ‘mechanical alignment’. This is a straight line going from the centre of the hip, through the centre of the knee, to the centre of the ankle. In conventional surgery, the surgeon uses their experience to make educated guesses about the position of this line, which they use to determine the placement and angles of the cuts they make in the bone to attach the implant. But the patient’s mechanical alignment is not easily judged on the operating table. Once you have registered the leg, the computer builds a very accurate model of the knee and displays it on a screen, along with guides to the mechanical alignment. You then use these lines to plan the cuts you need. The lines for the cuts are also drawn on the virtual model of the knee. This allows for a very personalised approach to executing the surgery—I can change the cuts I am making for a patient by one or two degrees, or change the angles by very small increments to make sure that each knee is well balanced and customised. What is the advantage of robotic surgery? Because the registration process creates an individual mechanical alignment for each patient, we can choose the implant that best matches them and their unique anatomy. Also, some of the pain that people get post-operation is because they have tight ligaments, or the kneecap isn’t sitting in the right place. They may require revision surgery, which involves going back in to change the relationship between the implants and the mechanical alignment or soft tissue. This is, unfortunately, still too common. With robotics, we have information unique to the patient, so we can adjust the position of the prosthetic more precisely to get them the best result. Once you have planned the cuts you need to make, you programme the depth and the angle of each one into the computer. The robot itself is a handheld system, which you use to burr away the amount of bone that you have planned to within an accuracy of 1mm. If you try to go deeper, the cutting blade will retract within the stylus. It is a very precise way to work. Is this changing the way you think about surgery? Absolutely. I am now individualising it in a way that was not possible before. We are all different in the way our knees are aligned, in the way we walk, in the way our soft tissues are made. Traditional knee replacements are fitted using data based on normal population studies. This says that the average alignment for a knee requires a zero degree cut and, for example, a three degree slope. With new technology, I can see that the best cut angle for a particular patient may not be zero but five. It is a big difference. I can also make surgical decisions based on the nature of soft tissue on each side of the joints, and so balance the knee better. This all leads to improved outcomes. What is the direction of travel in innovation? The robotic elements of the system are getting more sophisticated and intuitive. I am hoping that in the next five to 10 years I will have an autonomous robot arm that will remove the required bone much more accurately and quickly than a human can. We are moving towards partial autonomy of the robot. The most important aspect in the surgery is the plan the surgeon makes. The better the plan, the better the outcome for the patient. Using the robots to do certain parts of the cutting releases the surgeon to spend more mental energy making sure the plan is the best it can be and is being performed accurately. Will robots ever be used to carry out complete operations? I don’t believe so, because the surgeon still has to analyse what they see in situ. Once an operation has begun, the surgeon needs to make decisions depending on what they find, which may require changes to the original plan. Robots can’t do this, so I don’t believe they will be able to perform entire procedures. But they will increasingly help the surgeon to be much more consistent and accurate. I think the implants we fit could be much smaller but equally effective. We have run a trial of such implants here at The London Clinic, where we only replace the areas of the knee that are worn. This can be quite a small area, yet still have a large impact on the patient’s day-to-day life. In this scenario, when patients are 30 or 40, you only replace very small amounts of bone with the implant. Then when they are 50 or 60, when more bone may be more worn away, you will be able to come in, take out that original prosthetic, and replace it with a new one—again just replacing the worn areas. There is even the possibility that the first intervention may slow down or even halt further damage to the area, but we will have to wait a while for further clinical trials and datasets before we can say for certain. My personal feeling is that it is a possibility, and this is precisely the direction we need to take to improve patients’ function and allow for activity maintenance in later life.